Billboard magazine has been the bible of the music industry since the first charts were published in 1951. In the beginning, songs were rated by retail sales, in what was then the heyday of vinyl. 78 rpm disks, made of a brittle material and covered in shellac, were still being sold, but quickly becoming less popular. The origins of Billboard go back to 1894 in Cincinnati, Ohio. 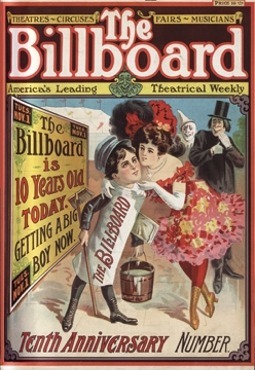 Titled Billboard Advertising, the trade publication was published for the bill posting industry. Over the years, The Billboard included coverage of the amusement business, movies, radio, television, and of course, the music business. The Billboard’s 10th anniversary issue cover. With the development of the jukebox industry during the 1930s, The Billboard began publishing music charts. Originally, there were only three genre-specific charts: Pop, Rhythm & Blues, and Country & Western. Billboard, published its first music hit parade on January 4, 1936; its first record chart was calculated on July 20, 1940. Billboard first published weekly music charts in 1940, there were sales charts and there were airplay charts. These separate charts became the “Hot 100” on August 4, 1958. Best Sellers in Stores – ranked the biggest selling singles in retail stores, as reported by merchants surveyed throughout the country. Most Played by Disk Jockeys – ranked the most played songs on United States radio stations, as reported by radio disc jockeys and radio stations. Most Played in Jukeboxes – ranked the most played songs in jukeboxes across the United States. At that time, this chart used to be one of the most important channels for measuring the popularity of a song among the younger generation of listeners, as many US radio stations resisted adding rock and roll music to their playlists for many years. Billboard publishes a complete list of its rated records on its website. You can browse the charts from 1950 to present here. *Portions of this article were sourced from Wikipedia, the free encyclopedia. Text is available under the Creative Commons Attribution-ShareAlike License; additional terms may apply. This article, written by Edward Southerland, first appeared in Texoma Living! Magazine, March 19, 2007. 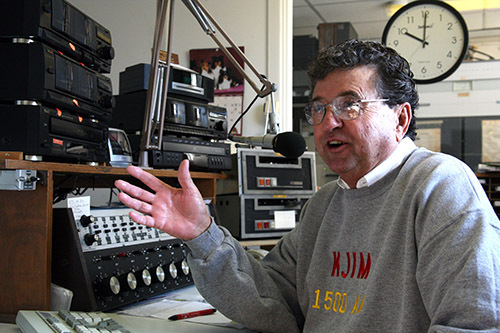 Bob Allen has been in the radio business since he was a kid in Oklahoma City. 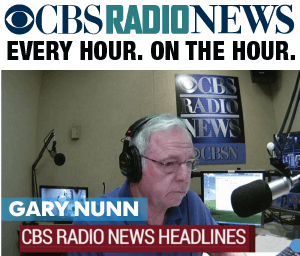 He runs the only locally owned and operated radio station in Grayson County, KJIM 1500AM. Well and good, but even Allen’s impressive credentials and long experience in broadcasting pale to his real claim to fame. Bob Allen knew Icky Twerp. That’s right, he knew Icky Twerp personally, and he knew Ajax and Delphinium and Arkadelphia, too. They were apes. 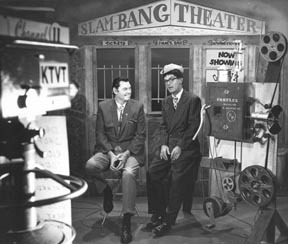 The Slam-Band Theater set at KTVT-TV, Fort Worth. Icky Twerp was Bill Canfield, who graduated from TCU in 1955 and went to work for Fort Worth department store. 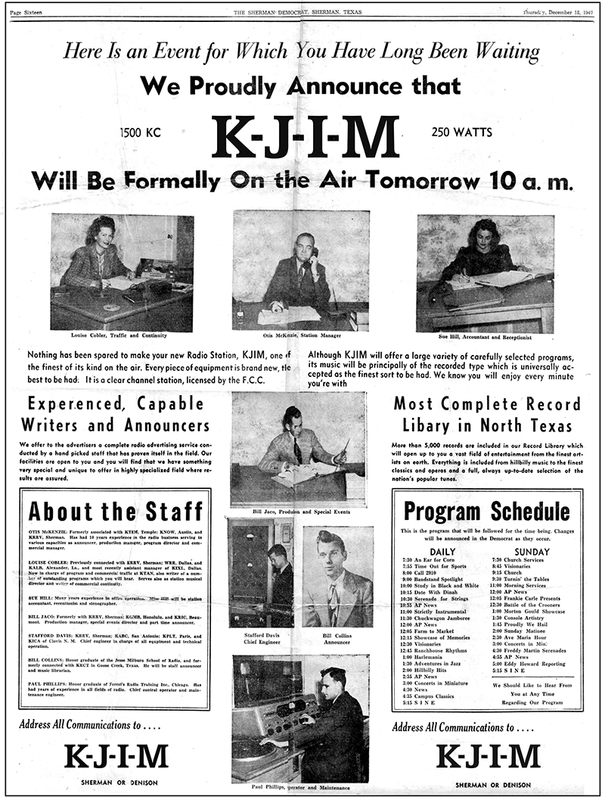 When a friend suggested he might get some work in television at KFJZ-TV Channel 11 —the station would become KTVT-TV later on —Canfield gave it a whirl. The television whirl lasted more than 30 years. He started by creating commercials for the station’s advertisers. It took a special sort of wackiness to come up with a character called Mortimer Moneybags to promote a local bank, and the station executives knew talent when they saw it, so they turned Canfield loose to come up with other characters to host local shows. In those days, stations carried a lot of original programming, and this was especially true at KFJZ-TV. In those days, stations carried a lot of original programming, and this was especially true at KFJZ-TV. 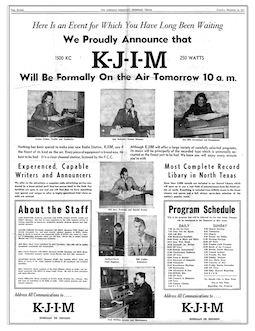 There were four stations in Dallas and Fort Worth, and KFJZ-TV was the only one without a network affiliation. With a line up of old movies, and kid shows, they were scrambling to fill the broadcast day, and Canfield, with his amazing imagination quickly became the man to call when the station need something to put on the air. The opening day of “Slam Bang Theater” on KTVT Channel 11. 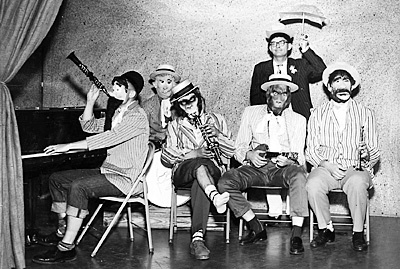 Icky Twerp with the umbrella and members of his House Ape Band. He began as Captain Swabbie, the host of a cartoon show. Then came Ickabod Twerpwhistle and then Icky Twerp. Icky wore a wrinkle black suit, black glasses and a tiny cowboy hat that perched atop a mound of frizzy hair. Late at night, Icky Twerp transmogrified into Gorgon, the spooky host of Nightmare, a station’s weekly offering of horror movies. 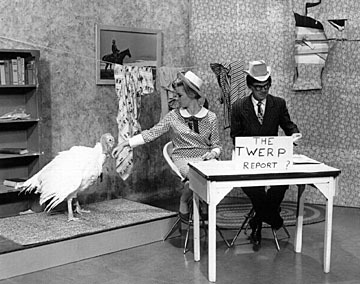 If you were a kid living within range of Channel 11 in the late 1950s and early 1960s, you watched “Slam Bang Theater” with Icky Twerp every day. It was not a negotiable option, even if you parent were less than enthused by your taste in shows. It was Icky, the apes, the Three Stooges, cartoons and the more than occasional flying cream pies – just the kind of stuff kids love. Icky Twerp became so associated with the Stooges that they put him in their 1965 movie, The Outlaws Is Coming. Bill Canfield on the set at KTVT-TV. Canfield took a job in Denver in the 1970s, and Icky Twerp said farewell, announcing to his loyal fans that he had inherited the Lost Twerp Mine from Uncle Ickabod. With a shovel on his shoulder he waked across the station parking lot and in to the sunset, while “You’ll Never Walk Alone,” played in the background..
Canfield came back to Dallas in time, and back to television as a sales representative, and in 1989 a local Dallas station taped the Slam Bang Theater 30th Anniversary Show before a live audience of former fans, now grown up, in Arlington. Top complete the honors, the governor and the legislature proclaimed it “Icky Twerp Day,” from one end of the Lone Star State to the other. Not bad for a guy who let apes hit him in the face with pies. Bill Canfield died in Fort Worth in 1991. As for Bob Allen, he had a notable career in radio and advertising from one coast to the other, but he always wanted his own radio station. 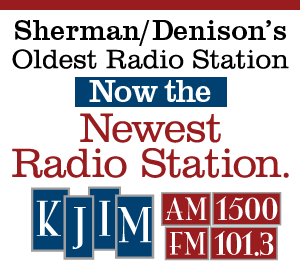 He got it when he moved to Sherman in 1994, bought KJIM-AM, then a religious music station, and gave it a new life with a lineup of nostalgia music and old radio shows. Yes friends, Fibber Magee and Molly, the Great Gildersleeve, Jack Benny and the Lone Ranger did not die, they just moved to Texoma. This was a follow-up article written by Edward Southerland, was published in Texoma Living! Magazine’s June 2007 issue. The response from Twerpians, if that’s the word we’re looking for, was substantial, and so, to correct a few errors in the first piece and to expand on the phenomenon that captured a generation of North Texas children 50 years ago, here is a bit more, although not all, of the story. The meeting came to order at three o’clock in the afternoon at the home of George Nolen in Pottsboro. Present in fact were Nolen, Phil Crow and Clem Candelaria. Present in spirit were Ickamore Twerpwhistle, aka Icky Twerp, Mortimer Moolah, Gorgon, Captain Swabbie, Blitz and Blotz, of department store fame, Constable Cavendish, Louie Lavender and of course, the apes, Ajax, Arkadelphia, Delphinium, Linoleum, and Clyde. The show aired mornings and afternoons. Nolen: “In those days a lot of the men were off at war, so they would hire kids. My voice changed one day, and I went to work in radio the next day. That was 1945. I was born in Texarkana and grew up in Denton. I started on a station in Denton, KDNT, 100 watts. We covered both blocks. Crow: “I went to work for Channel 11 in 1959 and worked for them for 36 years. Channel 11 was an independent, no network affiliation. That meant that everything that went on the air came out of that building. “Management bought the rights to the Three Stooges, and they went to Bill Camfield, who was already at the station doing a little bit of everything, and asked him to come up with a show to showcase the Stooges. Bill had a degree from TCU in creative writing, and being the creative fellow that he was, he came up with a character called Ickamore Twerpwhistle and a show called Slam Bang Theater. Icky Twerp grew from there. “Camfield would elicit help from everyone who worked at the studio —camera men, lighting people, secretaries— to be other characters. Clem Candelaria and I were both TCU graduates who were just starting in television. That’s how we were involved. “One of the things people remember about Slam Bang Theater is the apes. There were five apes, Ajax, Delphinium, Arkadelphia, Linoleum, and Clyde. Camfield had a deal with Harris Costume Shop in Fort Worth. We gave them ads, and they lent us costumes. Bill would go out there and just wander through the warehouse and bring props and costumes, including the rubber ape masks, back to the station. Crow: “Slam Bang ran five days a week, and for each show we would do an opening, a little sketch leading in to a Three Stooges short. We’d do a feature sketch inside the middle of the program, and we would do a close. We did it for 13 years, from 1959 to 1972. It was the highest-rated children’s program on television in Dallas-Fort Worth. “The kids loved that.” There could not be a better epitaph for Bill Camfield and his characters than that. Camfield left Channel 11 in 1972 to become the program director for a station in Denver, and Icky Twerp bid farewell. He announced to his loyal fans that he had inherited the Lost Twerp Mine from Uncle Ickabod, and with a shovel on his shoulder, he walked across the station parking lot and into the sunset, as “You’ll Never Walk Alone,” played in the background. Camfield did not find the gold mine and returned to Texas a year later, but except for the occasional personal appearance, he put the characters away and concentrated on a broadcast consulting company he started called Business Communications, Inc. Camfield died in 1991. TCU awards a Bill Camfield Creative Writing Scholarship, and in 2005, he joined the Ernie Kovacs Comedy Hall of Fame. But there is something else. A research study conducted by IPSOS, for iHEARTMEDIA in JANUARY 2015, finds that AM/FM radio remains the overwhelmingly preferred audio entertainment option in the car.While consumers do use new streaming services, virtually all consumers —99%— are comfortable with the current AM/FM in-car radio operation. And 91% of consumers say they prefer physical AM/FM radio buttons and controls built into the car dashboard, rather than AM/FM being an app that appears in the car's electronic interface (with only 9% saying they would want it changed into a dashboard app).An additional finding was that while AM/FM radio remains paramount in the car, consumers use their in-car CD player three and a half times as much as they use any digital music service. AM/FM radio still dominates in-car listening as the top platform used, with 84% of consumers using it in the car, followed by CD players at 64% -- but radio still maintains a leadership position over the next closest service choice, SIRIUS/XM -- which had 22%. PANDORA was 18%; iHEARTRADIO was 8%; HD RADIO 7%; and SPOTIFY was 7%. 80% of consumers chose AM/FM car radio as the top option for their car’s entertainment system, followed by the CD player at 68%, satellite radio at 45%, and a streaming music service at 34%. “Overall, this study makes it clear that in spite of consumers' love of apps and new digital products, they have a great attachment to their AM/FM radio and an overwhelming desire to keep its operation and function as it is,” said IPSOS MEDIACT VP THOMAS SPINELLI. The study, conducted by IPSOS for iHEARTMEDIA in JANUARY 2015, surveyed a nationally representative sample of 1036 adults 18+.